The position of links in your email newsletter or e-shot can have a big impact on your click through rates. Here’s a brief case study from our client British Bespoke Auctions. Their monthly newsletter is a preview of the following week’s auction, and includes links to the various auction categories as well as photos and links for selected items. We usually achieve a 40% click through rate which is pretty good. However we assumed that all subscribers simply wanted to be able to home in on categories and items of interest. 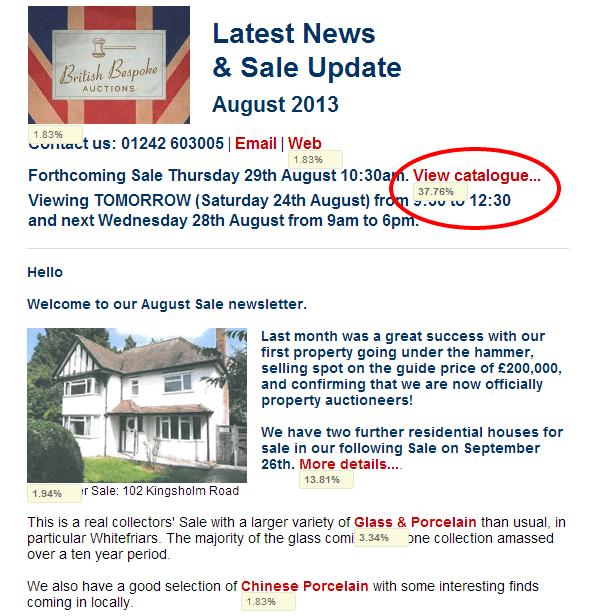 So we added a prominent View Catalogue link at the top of the newsletter. you can see the result below – see the red ring. A massive 38% of clicks came from that single link thus proving our theory that all some people wanted to do was view the catalogue! We also increased the overall click rate from 40% to 51%. Try new approaches and put yourself in the shoes of the recipient. Then test to see if that approach has been successful, by monitoring trends for opens, clicks and unsubscribes. The screen shot below from Campaign Monitor uses a clicks map, which is a very powerful way of working out which links and which link positions worked well. You could use this to repeat the same links in different positions in a campaign, and then analyse which was the more popular. Mailchimp also has this functionality. 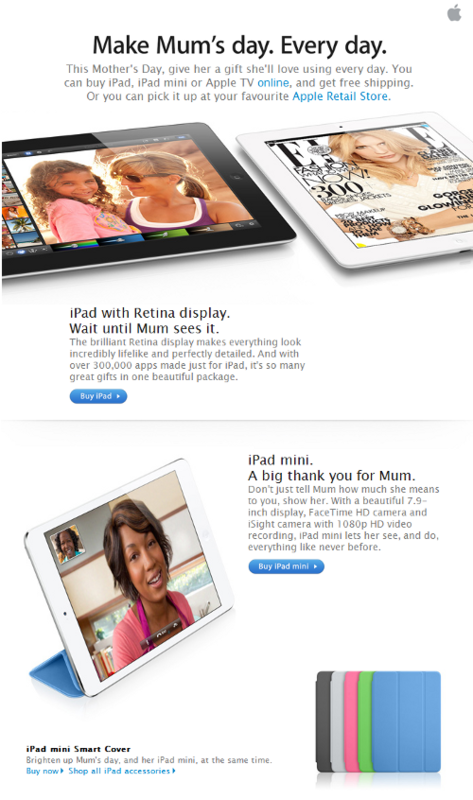 I’ve always been a big fan of Apple’s email marketing and a Mother’s Day email I received today is no exception. Let’s take a look at why it’s so good. 1. Firstly the from name and subject line. The from name is blissfully clear. Simply “Apple”. Not “Apple Newsletter” or “Apple Europe”. The subject line is succinct and evocative and uses the word “Mum” rather than the more generic “Mother’s Day”. 2. Secondly the email itself. The images below are an extract from the full email. Not actual size. < The branding is subtle. No need for a massive masthead. < Short and succinct headlline. < Clear how to buy information. < The design has plenty of white space making it much easier to read. < The call to action”Buy iPad” is succinct. Far better than “Click here to visit our online store”.